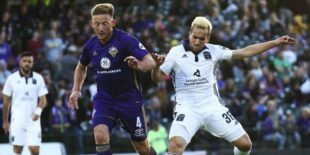 Defending 2017 USL champion Louisville City FC remained undefeated for the 2018 season Saturday night at Louisville Slugger Field, defeating a never-say-die Bethlehem Steel squad 3-1 . 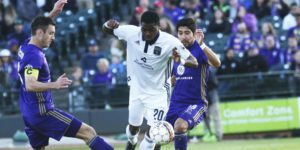 Louisville City put Bethlehem to the sword in a ten-minute stretch of the first half. Cameron Lancaster scored a brace, notching goals in the 13th and 22nd minutes, while Illia Ilic added one in the middle in the 17th minute. Louisville has taken 16 of the 18 points available so far this year. Marcus Epps pulled one back at the end of the half for Bethlehem on a nice shot from 18 yards. Bethlehem attacked all-out in the second half, causing the game to stretch from end to end and producing some meaningful chances and excellent saves from both keepers. Steel keeper Jake McGuire will not get a formal save for deflecting a Brian Ownby key pass that would have found Lancaster for a hat trick in the 69th minute, since there was no actual shot on target. For the hosts, keeper Greg Ranjitsingh made a double save against an original Chris Nanco shot and an Aidan Apodaca rebound blast from inside the penalty spot that would have made the last several minutes interesting. Coach Brendan Burke will likely commend his squad’s performance but lament the result, as he has done before this season. There certainly is no quit in his club. Put to the sword: Three factors created the 10-minute break-out for the defending champs. Louisville’s individual player quality and their well-honed coherence within coach James Connor’s system. Bethlehem’s central defense, rebuilt from scratch so far in 2018. And the organization-wide defensive injuries that meant that Bethlehem had only one trained center back on its game-day roster. Brandon Aubrey was the sole trained center back, and right back Matt Mahoney once again shifted into the other center back role as the best available option. Recent first-team signing Olivier Mbaizo played the entire match at right back. It was both his professional debut in North America and a medical rehabilitation and conditioning assignment. On the left side, Prosper Chiluya continued his run of starts, making steadily fewer obvious mistakes as he takes advantage of the opportunity Fabinho’s knee injury has created at left back. The original Steel signing: Derrick Jones is gaining experience as the number six in James Chambers’ absence. Jones shows excellent dribbling skill in the center of the pitch, and towards the end of the game he was beginning to use it to get himself open to attempt a few “key” passes. None succeeded, but one could imagine him analyzing his own play as the game went one and realizing that dribbling alone was not having success creating offense. Fact: Bethlehem Steel FC’s roster is thin if not positively skeletal. Only Seattle Sounders 2 are as lean. Here are the player development sides’ USL roster sizes. And two of the Steel 13 are injured. None of the 24 independent USL sides come close to the low and mid-teens in their roster quantities. Louisville: Greg Ranjitsingh; Paco Craig (Magnus Rasmussen 27’), Alexis Souahy, Sean Totsch; Kyle Smith, Oscar Jimenez, Speedy Williams, Paolo DelPiccolo ©; George Davis IV, Ilija Ilic (Brian Ownby 58’); Cameron Lancaster (Luke Spencer 70’). Unused Substitutes: Tim Dobrowolski; Chris Hubbard, Niall McCabe.